I’m celebrating the beginning of winter by showing you an image that goes along with the Looking and Learning Theme for December in our SchoolArts Magazine: Stories. I don’t really dig the endless winters in New England, but it’s helpful to see beauty in nature as a way of getting through it. And when I saw this gorgeous little work from the Brooklyn Museum of Art, I did some digging about the story behind it. 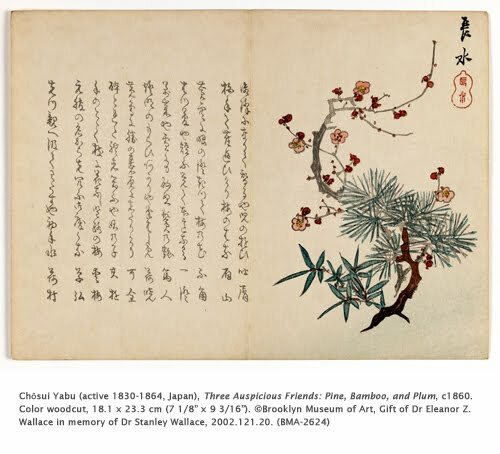 Why would an artist depict pine, bamboo, and plum together? Why are they associated with winter? Ah, there’s the crafty part of this week’s blog: the combination of these three plants is actually a harbinger of spring (yes, spring). Looking out the window right now as the snow comes down, I don’t think it’s a bad thing to think about spring, especially when there’s a STORY. Plum blossoms and bamboo have a long history as venerated subject matter in Chinese and Japanese painting. Little did I realize that when they are grouped together in a work of art, they are called the Three Friends of Winter, or Three Auspicious Friends. Plum blossoms bloom earlier than any other flower in the spring, even in severe winter weather. Pine and bamboo are hardy enough to withstand winter weather as well. So the Three Auspicious Friends are three plants that survive in winter and look beautiful doing it. The combination in Japanese is called Sho-Chiku-Bai: Sho (pine) represents longevity, Chiku (bamboo) represents perseverance, and Bai (plum) represents courage. Longevity, perseverance, and courage are handy attributes for plants to have in winter. However, these symbolic qualities are also applied to people in Japanese art. Courageous literary characters are often represented in kimonos with plum blossom, bamboo, or pine patterns. Chōsui Yabu was an artist who created prints in the ukiyo-e style, depictions of the pleasures of city life of Ed o period Japan (1615-1868). Ukiyo-e artists also produced surimono, greeting cards printed privately as gifts for New Year, cherry blossom time, announcements, or other special occasions. 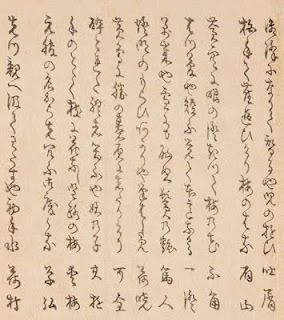 Surimono were more or less a standard size and almost always contained a poem. Look at the expressive line in the cursive Japanese on this card! The card most likely celebrated the coming of spring. 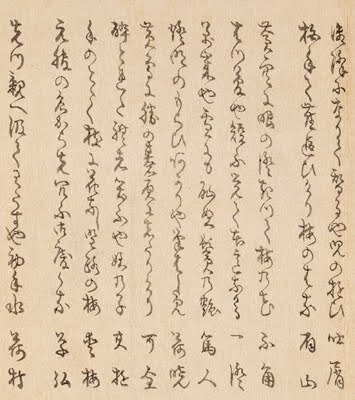 Surimono rose to popularity during the 18th century, and endured in popularity until the end of the 19th century, when Japanese publishers began mass-producing greeting cards from earlier surimono designs. Interspersed with some other woodcuts, here are some additional examples of surimono designs. Hey there ! I was pleasantly surprised when I loaded this page of your portal. What was the biggest reason at that moment when you to make your blog? Not What You Would Expect!